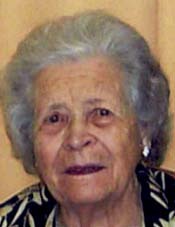 Freida Marguerite Welch died February 19, 2011 at Berthoud Living Center, Berthoud, Colorado. She was born August 18, 1918 in Proctor, Missouri, the daughter of James Irvin and Hattie Gerlt Thomas. The family moved to Midwest Wyoming in 1936 where she graduated from high school. She married Clyde Wesley Welch on August 21, 1937 in Casper, Wyoming. She moved to Loveland, Colorado in August 2003 to be near her daughters. She attended Buckhorn Presbyterian Church in Masonville, Colorado. She was a homemaker and devoted her life to her family. She had a tremendous faith in God and collected many poems about how God had blessed her. She enjoyed the beauty of nature and loved camping at Grand Teton National Park, her favorite vacation area. Survivors include her son Jim Welch of Glenrock, WY; two daughters, Carol Welch of Arvada, and Barbara (Rich) Pflieger of Loveland; four grandchildren and seven great-grandchildren; sister Augusta Jenkins of Casper, WY and close friend Ila Bratcher of Arvada, CO.
She was preceded in death by her husband Clyde, a grandson Mike Welch, brother Harold Thomas and her parents. A graveside service will be held Monday, February 28 at 11:00 a.m. at Willow Grove Cemetery in Buffalo, Wyoming. Memorials may be made to a charity of the donor’s choice or Front Range Hospice in care of Viegut Funeral Home.